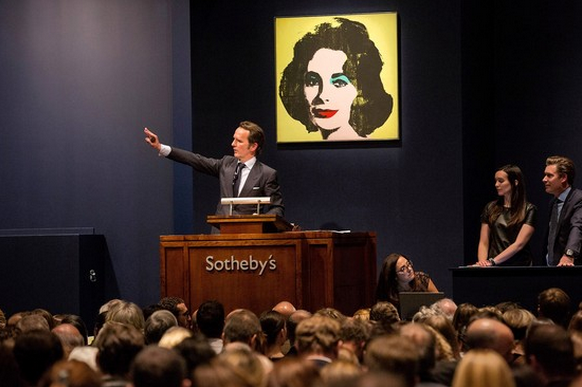 Tobias Meyer, formerly of Sotheby’s, selling Andy Warhol’s ‘Liz’ for more than US$20m in November 2013. Sotheby’s caved in to pressure from short-term investors last week by announcing it would pay shareholders a US$300m dividend in March and that it might sell its New York and London offices. Sotheby’s intended to use its cash position to grow into a diversified conglomerate holding positions in art and real estate. The cash allowed it to take principal positions in the lucrative business of buying entire collections and selling them off bit by bit. It was also a cushion for future downturns in the art market. However, activist investors such as Dan Loeb’s Third Point Capital(with 9.3%) and Richard McGuire’s Marcato Capital Management LP(with 6.6%) are trying to drive up the share price by forcing Sotheby’s to release its capital and real estate. With their special dividend announced last week – Sotheby’s (BID) reduced their chance to transform from a service provider hemmed in by fixed commissions and high overhead into becoming a vast storehouse of capital comprised of art, real estate and cash. Basically Sotheby’s is a company that sells art to the very rich (200 people make up 80% of their gross sales) taking a commission for their sales. This reason that the wealthy trust them is because their commissions are transparent and they are perceived to be the low cost producer. On top of this the very rich expect their suppliers of art to make grand gestures, have numerous offices in magnificent venues, take out expensive advertisements, produce coffee table quality catalogs, donate their employees’ time to charity auctions, support in depth research and provide sumptuous dinner parties to their clients on a regular basis. This scorched earth policy of low margins and high expenses has put many of their competition out of business but at punishing cost and great risk. To a significant extent they have succeeded but the model of slim mark ups and overwhelming overhead is difficult, maybe impossible for sustained growth and success. They are just as much a service organization supporting scholarship as a profit making corporation. It is a daily dilemma that challenges management with days spent doing research and nights entertaining their important clients. value from this enterprise will be the promotional literature used to create interest. The promoters have brilliantly figured out that new, unsophisticated art collectors coming into the art market primarily rely on auction records to make decisions on value. So they simply bid against each other at auction to create the illusion of value for their mass produced works of art. Sotheby’s benefits by taking the commission for one work of art that is bid up but the promoters then see vastly larger profits on the 100 examples of works of art by the same artists that they have in their inventory. Collectors looking solely at auction records are deservedly then hoisted by their own petards. dependent that they may be terribly reluctant to delve deeper into this practice. Their profitability would be greatly reduced and they would be reduced to going back to selling rare books and maps to cheap, knowledgeable people like me. For Sotheby’s to survive much less succeed they have to have a large cushion of cash for the downturns and art market busts that regularly occur. 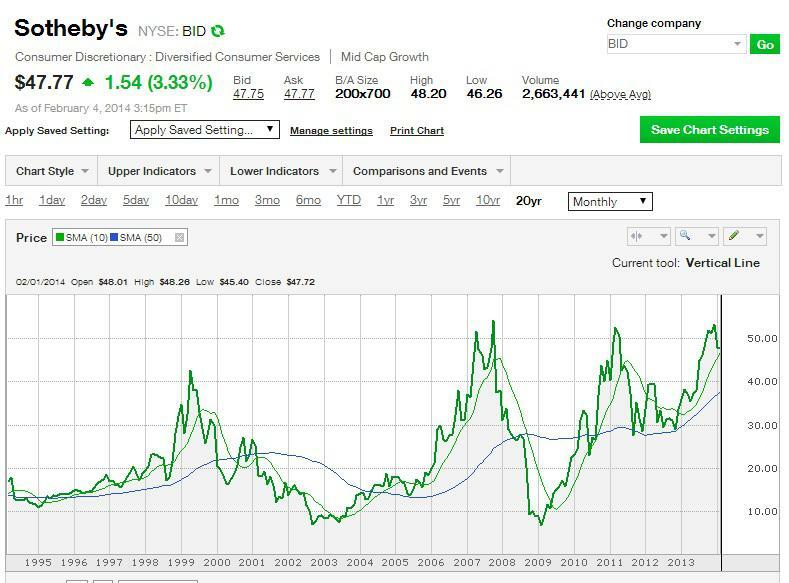 A look at their chart confirms violent downswings in their stock price over the years. Large drops have occurred in 1999 to 2000 going from $47 to $14.68 and again from 2008 to 2009 going from $61.40 to $6.05, and finally in 2011 to 2012 going from $52.95 to $27.53. Bill Ruprecht and his team had done brilliantly preparing for the next crash by building up an appropriate cash cushion. This was lost last week when they appeared to give into the wishes of some share holders who firmly suggested that they free up that position. Also the cash that will be paid out will make it harder for Sotheby’s totake advantage of excellent opportunities like the Matisse Estate that they purchased in November 1990 for $143 million where they subsequently made well over a 300% gross margin return on their investment. Notably they were not able to buy the Sonnabend estate thatcame available in 2007-8 that was bought privately for something in the range of $600 million. The simple fact is that an art dealer and auction house MUST be able to deal from a position of strength. The very rich have a well developed nose for fear and flee from those whose glands excrete even the smallest quantities. The Sotheby’s executive team have placed themselves back into the position of supplicants with this payout and the promise of payouts in the years to come. They have forced themselves back into the role of an under capitalized market maker at the mercy of their consignors and buyers who expect expensive service. very best works of art. They will now continue to be a wonderful organization sustaining confidence in the art market but that provides the overwhelming amount of the profits to their clients. So they will continue to be loved by all (except Christie’s) but at punishing and dangerous expense. They are now vulnerable to a severe art market correction or one US Attorney who starts an investigation into the manipulation of American, German, English and Chinese Contemporary Art Market prices by outsiders that Sotheby’s may have failed to detect, police, report and reject.